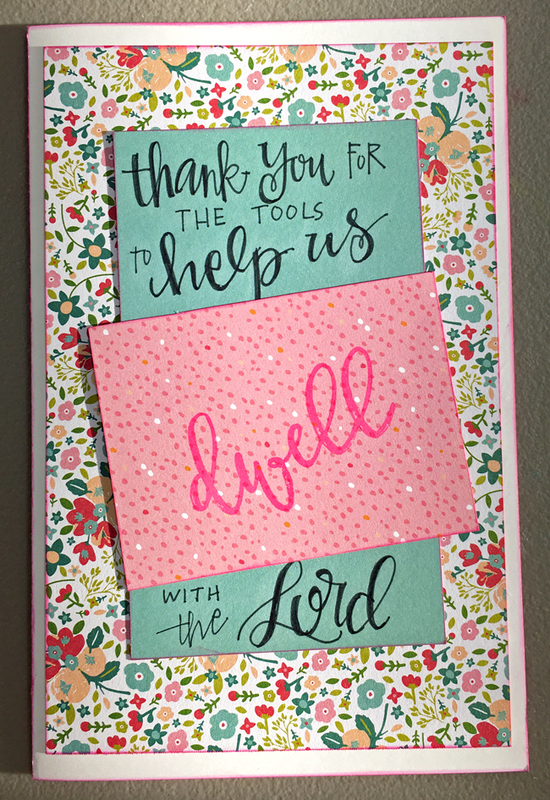 As I've been processing photos and getting some of my digital files organized recently, I realized I never shared the two cards I put together at the Illustrated Faith Retreat this past spring. 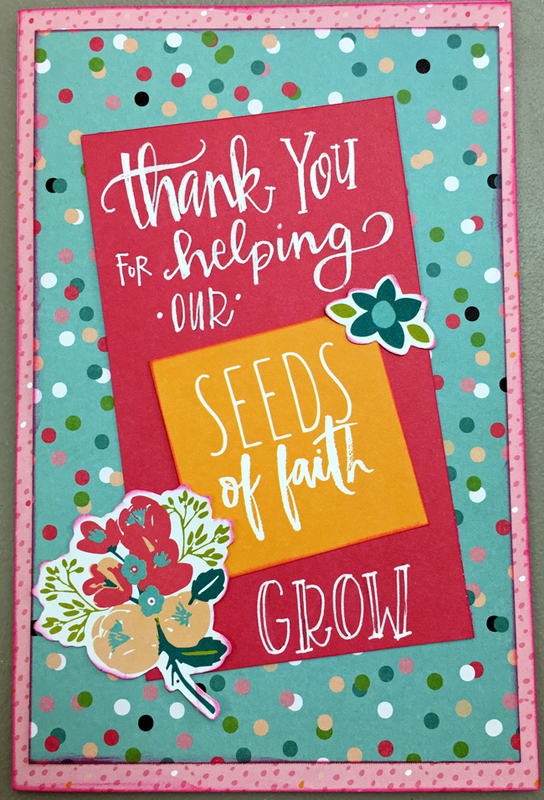 For each of these cards, I folded an 8 1/2 x 11 piece of cardstock in half, then simply layered some of the Illustrated Faith papers & embellishments we received at the retreat to create simple cards. 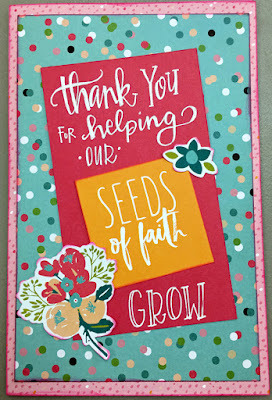 Each sentiment began with something from the paper collection (Seeds of faith on this first one & Dwell on the second one), then my friend Jana completed the sentiments with her wonderful creative lettering. 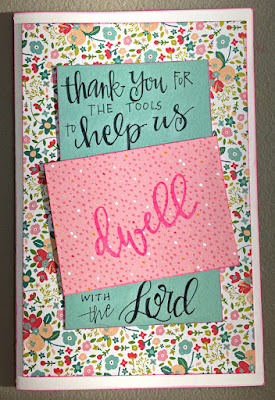 These cards remind me how easy it is to create handmade cards with just some pretty paper and a pen! Prayer is the way we communicate with the Lord. It is a conversation that includes praise, thanksgiving, confession, and requests. 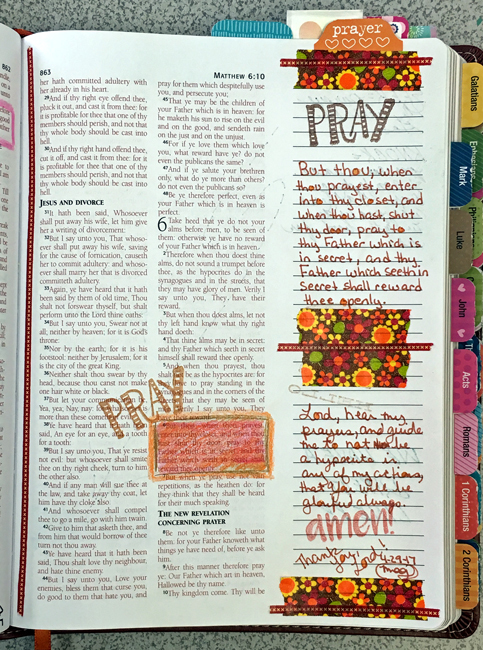 I've shared some thoughts on prayer previously (most notably HERE and HERE). There's not a right or wrong way to pray; the important thing is that we take time each day for prayer. There are numerous scriptures about prayer throughout the Bible that guide and encourage and instruct us to pray. 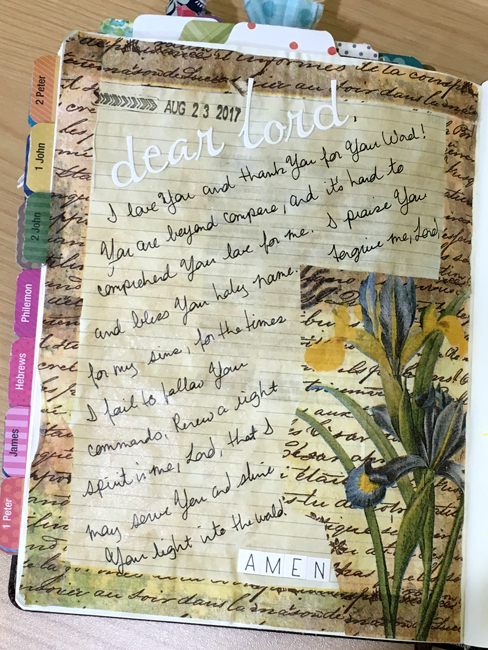 The book of Psalms is a collection of hymns, poems and prayers. 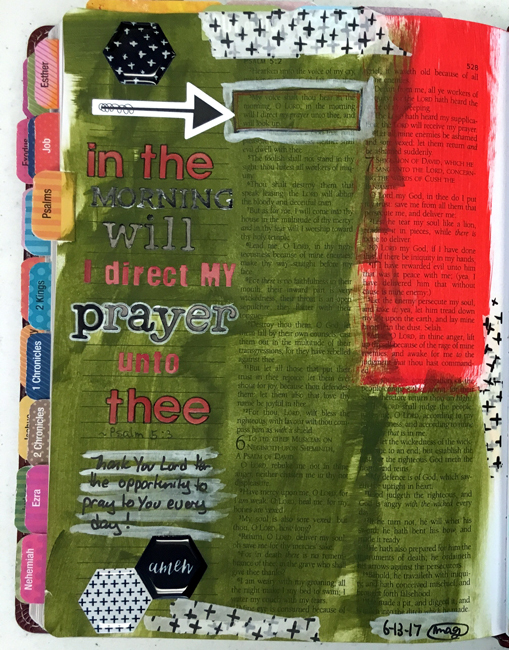 In Psalm 5, David prays to the Lord saying, "For to You I will pray. My voice You shall hear in the morning, O Lord; In the morning I will direct it to You." In Matthew 6, Jesus teaches us that when we pray, we should "go into your room, and when you have shut your door, pray to your Father who is in the secret place; and your Father who sees in secret will reward you openly." There are so many things that can vie for our attention and focus each day. Later in Matthew 6, Jesus admonishes us to seek the kingdom of God and His righteousness first. Sometimes when we pray, it's hard to focus and our minds tend to wander. 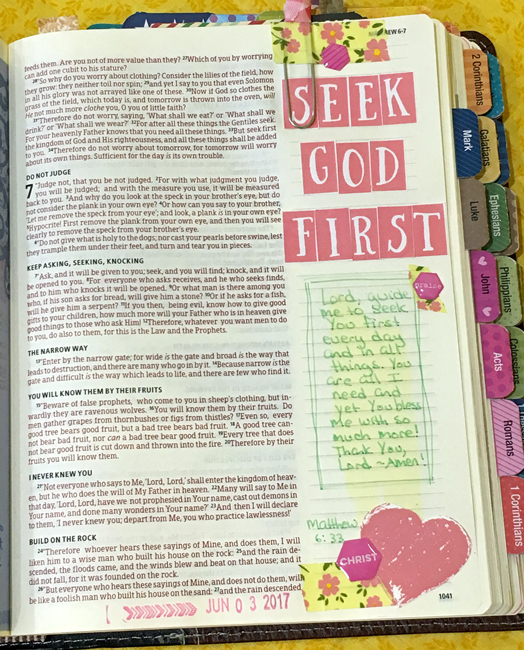 In times like that, I find it helpful to write my prayers out either in a journal or in my journaling Bible. 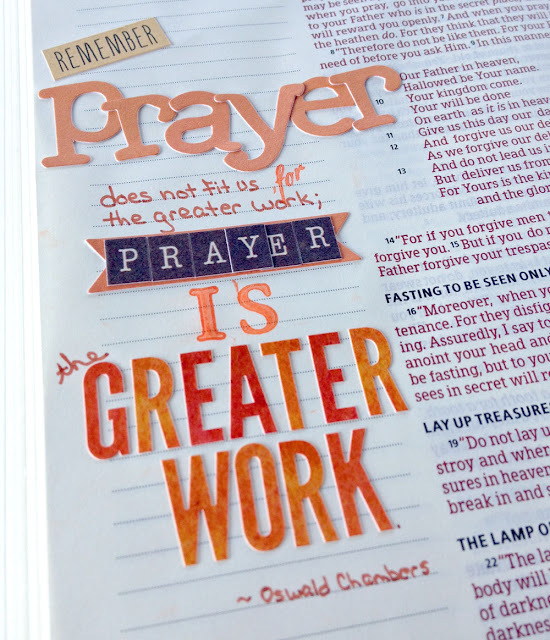 Regardless of when or how or what we pray, Oswald Chambers' quote (below) reminds us of the importance of prayer. I first read Boundaries by Dr. Henry Cloud & Dr. John Townsend over 25 years ago, shortly after the first edition was published in 1992. 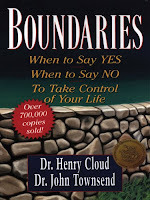 I recently re-read this book that has great information on establishing boundaries with family, coworkers, and friends. Some people view setting boundaries as a negative thing, however boundaries help us know when to say yes and when to say no; they help us heal and allow us to let in the good things while keeping out the "bad." The authors remind us that as we learn to set boundaries, others will often resist our boundaries, so it's important to have support systems in place. I enjoyed re-reading this book and felt good realizing that I continue to implement many of the lessons I learned from this book all those years ago. I met Tammie Durden and won a copy of her book, Get Up, Dust Yourself Off and Win!, at the Breathe Retreat last month. In this book, she shares her story of a time when she was dealing with a failed business, financial problems (so difficult that her car was repossessed), divorce, and the depression that plagued her. She then moves on to share that "life happens" and we must learn to pick ourselves up, do the work on the road to recovery, and have the courage to keep on and win. Get Up, Dust Yourself Off and Win! is actually a book and workbook all in one as each chapter is followed by questions and plenty of space to journal your answers. Along with being an author, Tammi is a speaker and empowerment coach who provides training and coaching around the globe. She Means Business is an easy-to-read book designed to help women build a business. 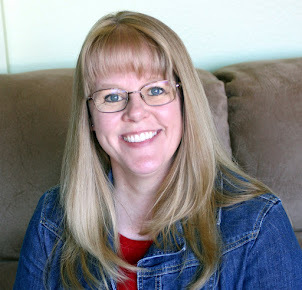 Carrie Green, the author and founder of The Female Entrepreneur Association, shares her story (along with other entrepreneur's stories) of leveraging the internet to create the business and life she dreamed of. There are action steps as well as a twenty-eight day challenge at the end of the book. Have you read any of these books? Please share your thoughts in the comment. Of all the items on my 50 Things To Do Before I'm 50 list, number 24 (Revise My Will) was definitely the least FUN of them all. In fact, Robbie even commented that this item seemed out of place when I originally created the list. 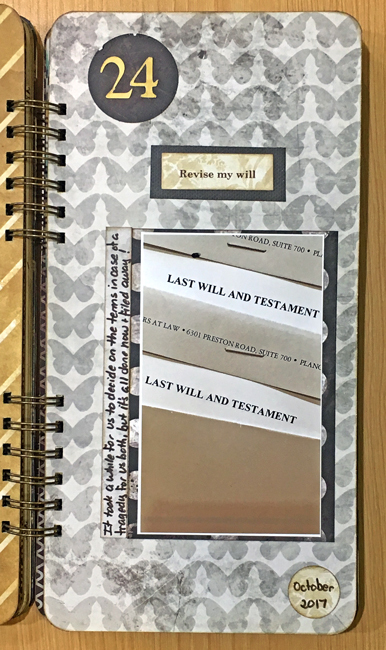 However, I knew this was something that I wanted to take care of as it had been quite a few years since we'd reviewed and updated our wills. I have to admit that I'm extremely excited to have this least FUN item checked off my 50 Things To Do Before I'm 50 list! Do you have a will? How often do you review/update it? 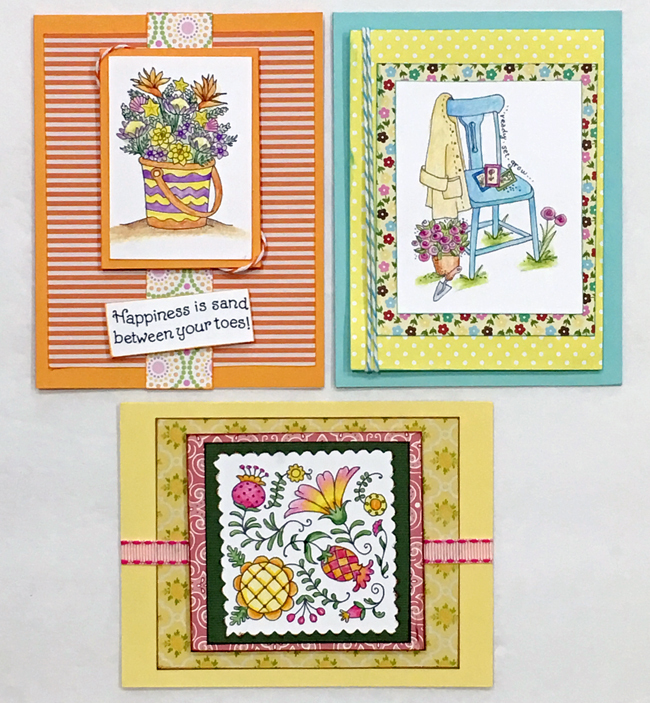 Earlier this year, I took an Introduction to Coloring Class taught by Peggy Jo Ackley of Pink Ink Stamp Company. 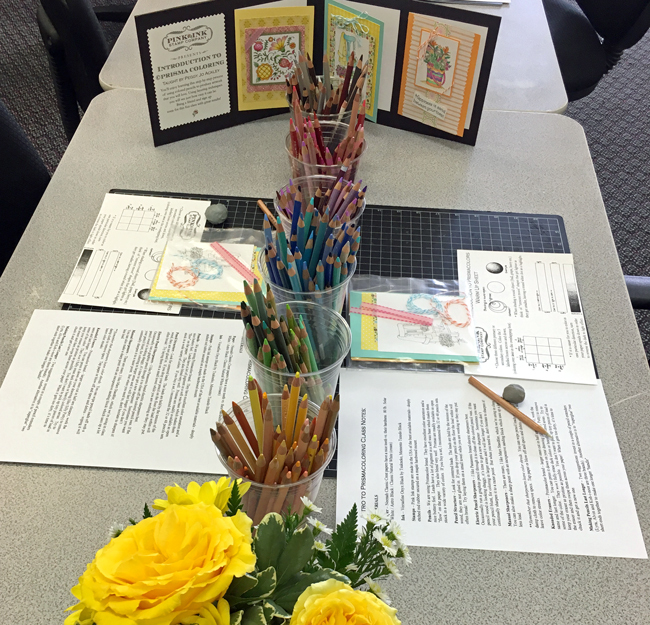 I immediately knew Peggy was going to be a great teacher when I showed up at Scrappin' Goodtime and everything was ready for the class to begin. And, of course, I really liked how those colored pencils looked all divided up by color! 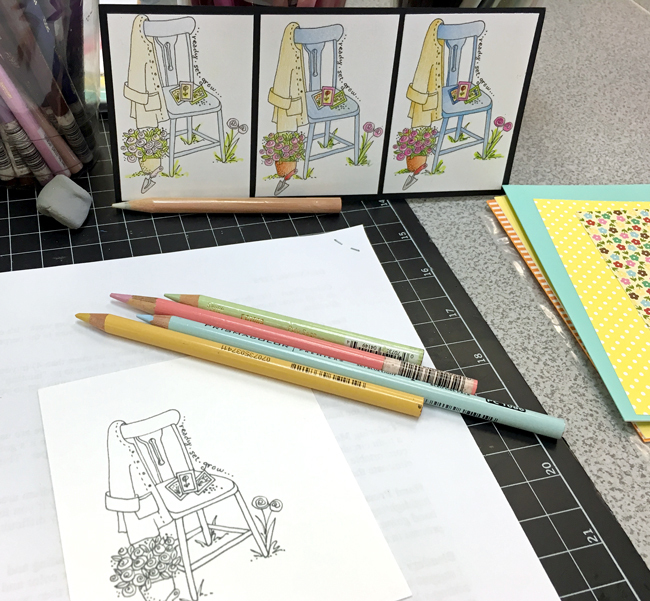 In this class, Peggy shared a step-by-step process for layering techniques with colored pencils. We began by adding the lightest colors, then layering additional colors to add depth and shadows. I especially like how she had examples of each step in the process for us to follow. 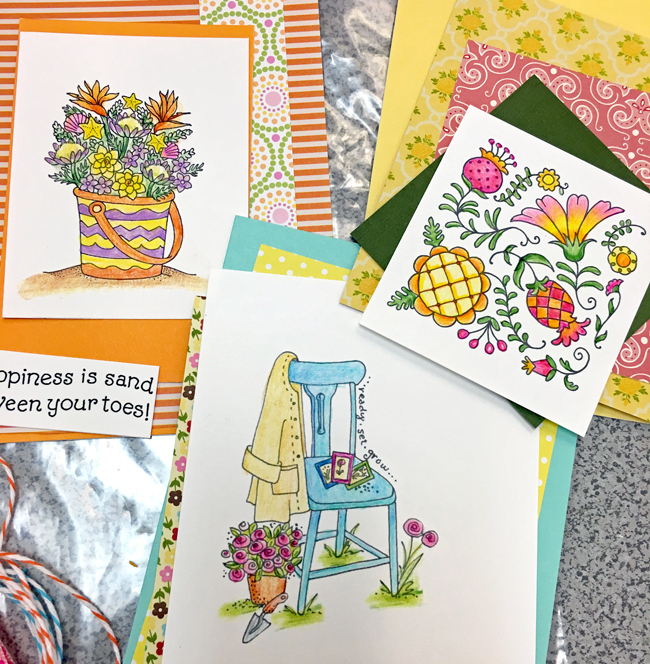 For each stamped image we colored, there were materials to create greeting cards. I didn't finish my cards during the class, but after I returned home I put them together. 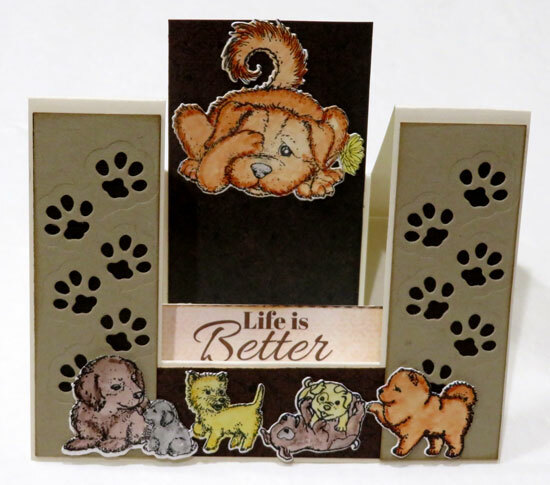 I enjoyed the class and really like the way the cards turned out. Since then, I've used this layering technique with many of my coloring projects! There's been quite a bit of happy mail around here lately! 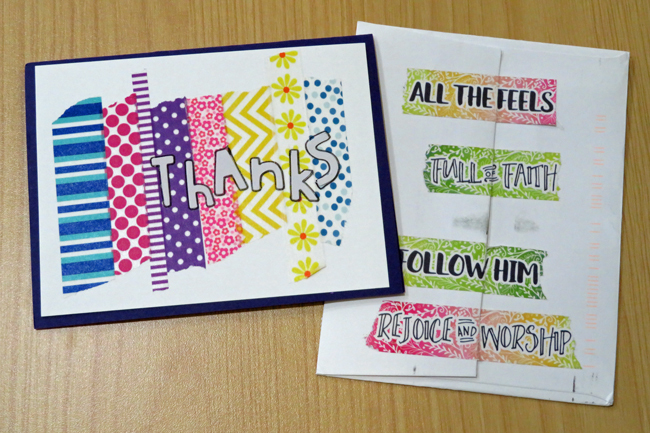 I received this FUN handmade thank you card in the mail from one of my email subscribers. 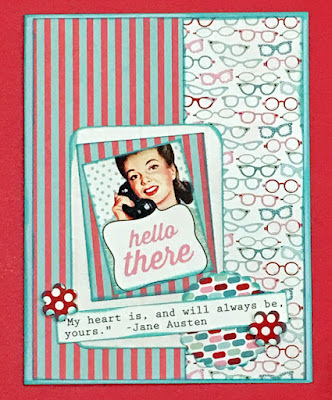 Of course, I love all the washi tape on the card and envelope! 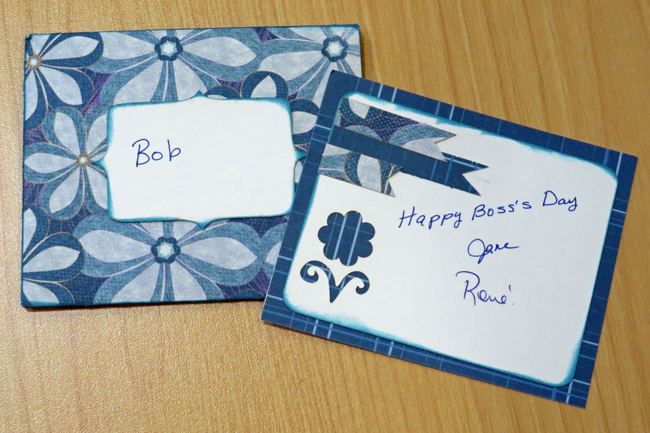 The same day, Robbie came home from work with a lovely handmade card & envelope (and gift card!) that he received for boss's day. 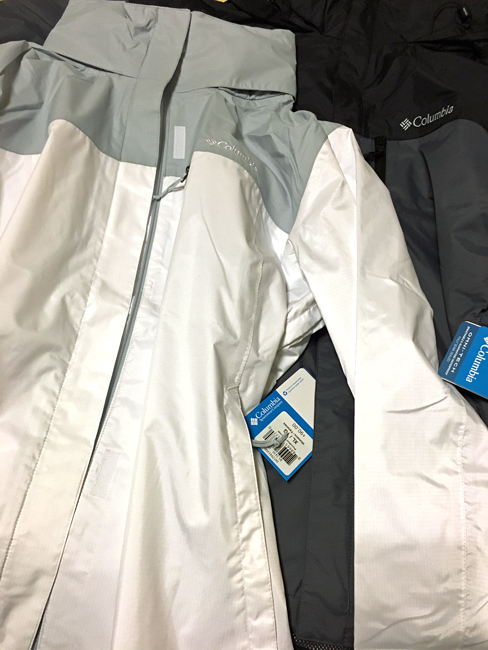 We ordered and received new rain jackets - looking forward to wearing these on our upcoming trip (although I do hope it doesn't rain every day!). Robbie ordered eight new three-ring binders . 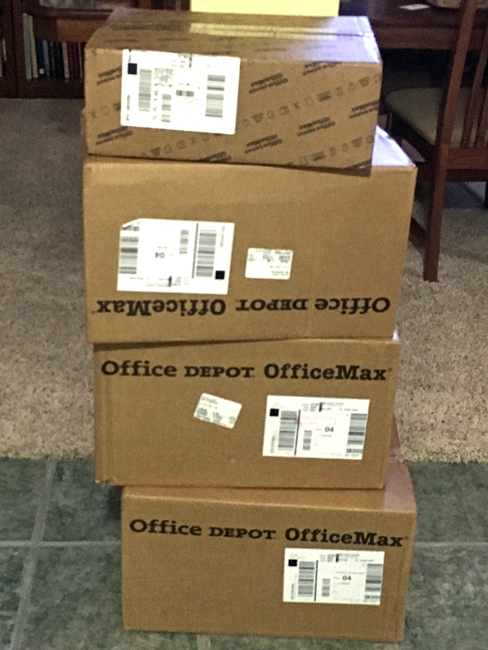 . . and they arrived in FOUR boxes! I'm certainly glad the shipping was free on this order! 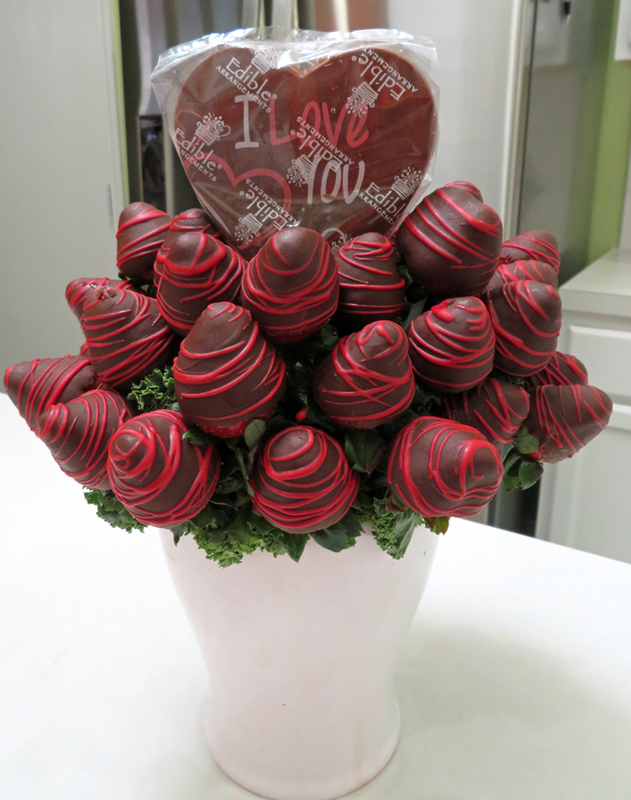 And, finally, I received a special delivery this weekend for Sweetest Day - chocolate and strawberries - oh so sweet! What FUN mail have you received lately? 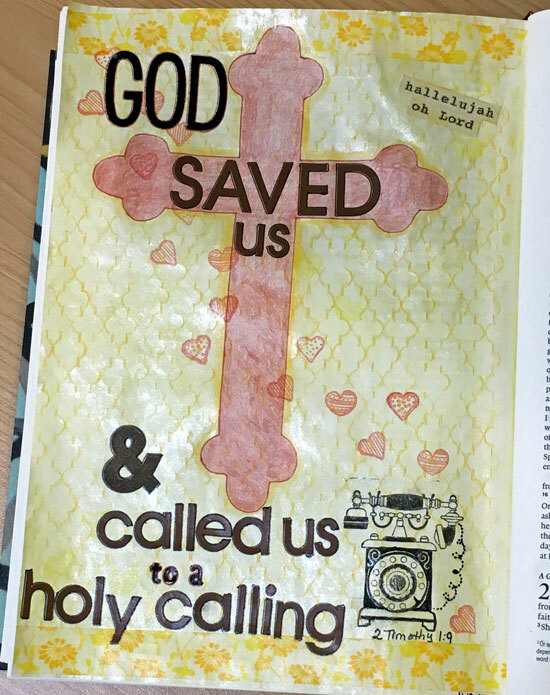 In 2 Timothy 1:9, we learn that God has saved us and called us with a holy calling. We are first called to salvation, then He calls us to serve Him. Our calling can mean making a drastic change (like leaving our home to be a missionary in another country) or being diligent to serve in our everyday lives (like teaching our children about the Lord or being a witness in the workplace). There are numerous examples of God calling individuals in the Bible, and the responses range from resistance to complete surrender. In 1 Samuel 9, when God first called Saul to be king, Saul responded with disbelief and questions because he was a Benjamite, of the smallest of the tribes of Israel, and ... the least of all the families of the tribe of Benjamin (verse 21). However, Samuel assured him that God would be with him and admonished him to do as the occasion demands (1 Samuel 10:6-7). We see a completely different response when God asks in Isaiah 6:8 "Whom shall I send, And who will go for Us?" 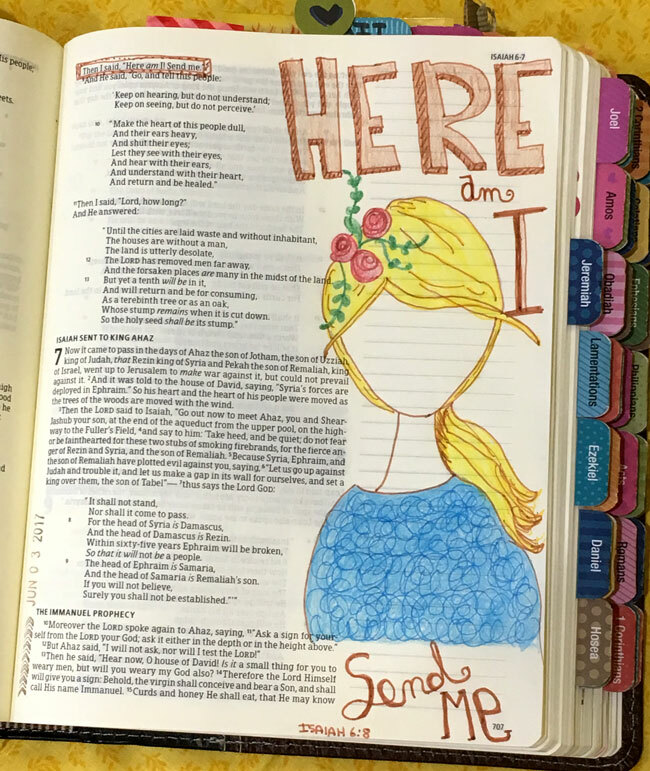 Isaiah boldly responds, "Here am I, send me!" 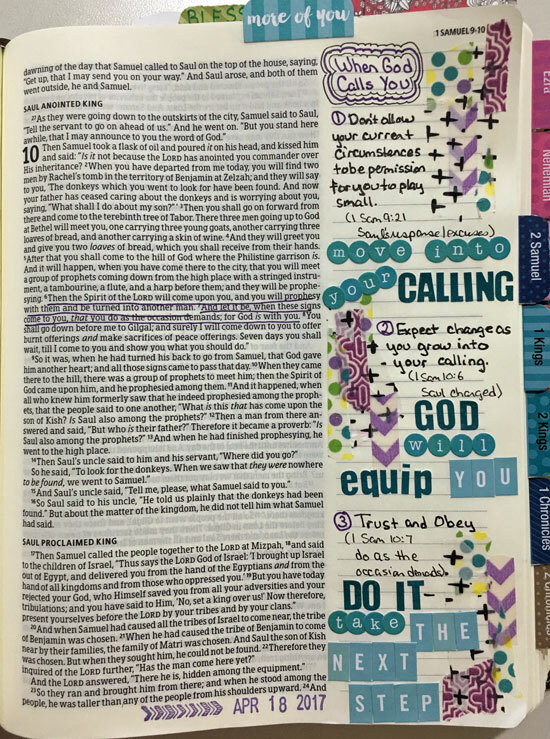 When God calls you, how will you respond - with unbelief and resistance or with complete surrender? As I continue to make progress on my goal to read all the Pulitzer Prize winners in fiction, I've recently completed a great book, a good book, and a terrible book! The 1986 winner, Lonesome Dove by Larry McMurtry, is 945 pages long and a fantastic story about two former Rangers, Gus McCrae and Woodrow Call, who leave Lonesome Dove, Texas, and drive a herd of cattle to Montana to establish the first cattle ranch in that territory. The book is divided into three parts and includes lots of characters: Jake Spoon, a former Ranger with McCrae and Call who returns to Texas after accidentally killing a man in Arkansas; Lorena, the whore from Lonesome Dove who ends up on the cattle drive and endures tremendous hardships after being stolen by Blue Duck, an Indian bandit; Deets, a black scout who has been with McCrae and Call since the Ranger days; July Johnson, the sheriff from Arkansas who sets off to find Jake but ends up having to search for his wife Ellie who ran off looking for her previous lover; and Clara, Gus's old love who lives in Ogallala, Nebraska. Then there are the cowhands hired for the cattle drive, the two Irishmen the crew pick up while stealing cattle in Mexico, the cooks who keep the boys fed during the drive, the two pigs who walk all the way to Montana, and a host of other characters whose paths they cross along the way. Of course, there are some not-so-savory parts to this story set in the 1870s - saloons & whores & drinking & killing & outlaws & hangings. Yet, the story would be unrealistic without all these components. This story draws the reader in and the characters are so well developed that it's hard not to feel a huge loss when several characters are suddenly scalped by Blue Duck mid-way through the novel. In fact, many (many!) characters die in the rough wilderness setting. The ending of the book is pretty good, although I discovered there are a couple of prequels and a couple of sequels to this story. This book is extremely well-written, well-paced, and believable (despite the fact that everyone eventually converges at Clara's house). After I put this book in Robbie's to-read pile, we watched the four-part mini-series, which is a great adaptation of the book! Empire Falls by Richard Russo is the 2002 winner. This is another long book (although not as long as Lonesome Dove! ), however it is a good book, easy to read and well-paced. The story is set in a small town in Main and follows Miles Roby, who has run the Empire Grill for the past twenty years. He is currently getting a divorce and worries about his daughter, who he affectionately calls Tick. Along with the divorce, Miles has to deal with his dad who is a essentially a bum and eventually runs off to Florida with a senile old priest and his soon-to-be ex-wife's boyfriend who insists on hanging out at the Empire Grill every day. The host of characters are well-developed and there are several story lines in this book, some shrouded in mystery. I did figured out quite a few of the "mysteries" early on - like who the man was that Miles' mother met at Martha's Vineyard when he was a little boy and who ran over Cindy Whiting, the crippled daughter of Francine Whiting (a rich woman who owns practically everything in the town of Empire Falls). This was a good read, although the story was not so compelling that it couldn't be put down easily. I really don't have much to say about A Confederacy of Dunces by John Kennedy Toole, the 1981 winner. This terrible book that's set in New Orleans is full of debauchery and stupidity and makes fun of everybody. There is not one group of people portrayed in a good light, and I can't think of a single positive thing to say about it. Last year, I attended my very first Japanese movie with English subtitles when we ventured out on a Thursday evening to see Shin Godzilla at a local Cinemark. 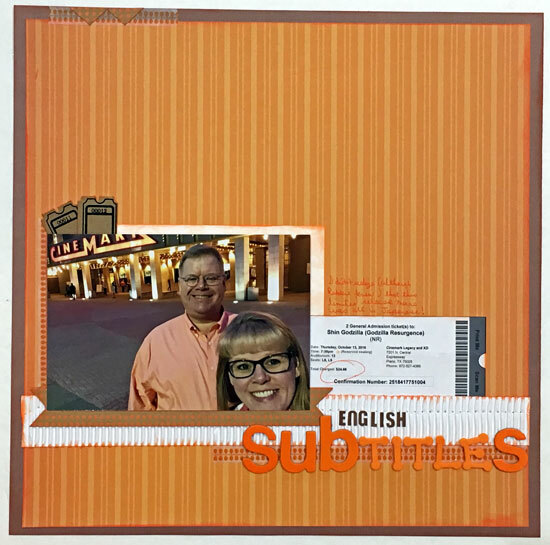 I snapped a photo of us outside the theater and used it along with our ticket printout on a layout for our 2016 chronological album. Journaling reads: I didn't realize (although Robbie knew) that this limited release movie was all in Japanese! I have to admit that I enjoyed the movie, although it took me a while to get in the groove of reading quickly and trying to watch the action, too! Have you seen any movies with English subtitles recently? 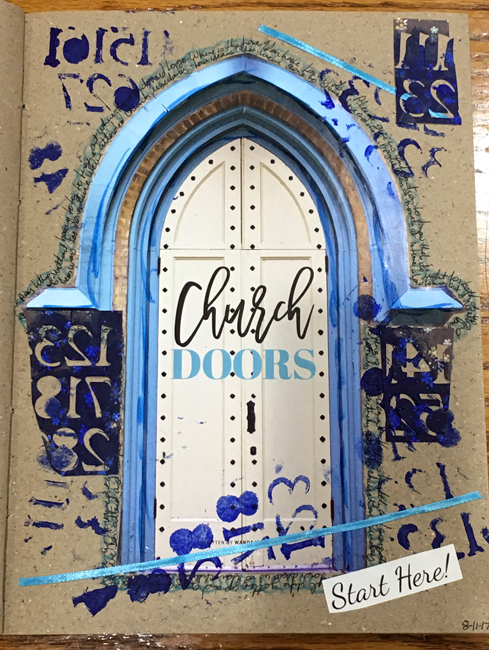 I haven't done much art journaling this year, however, I recently tore a page from a magazine because I liked the photo of a church door. We've been searching for a new church home after a couple of years of being inconsistent with our church attendance, so this image really jumped out at me. I cut out the image & created a page in one of my art journals. 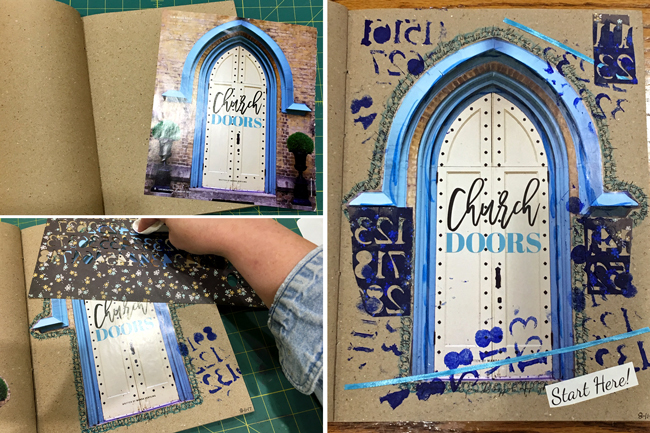 I stenciled in some random numbers, then added journaling around the edge of the door image. This was a FUN, quick page! Have you done any art journaling lately? Faith - a simple, five-letter word that holds so much meaning and potential in our lives. 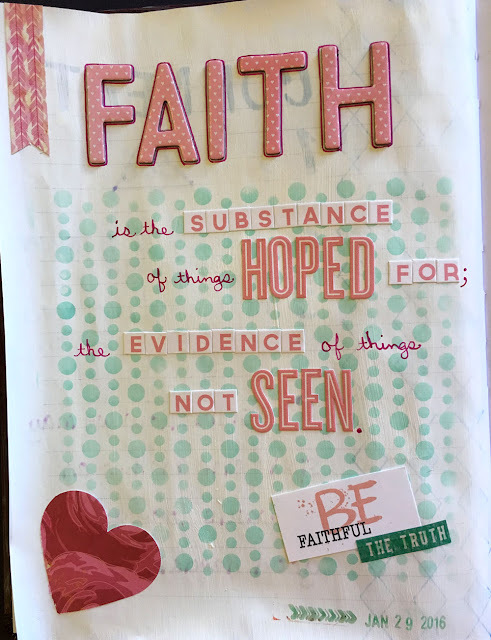 Hebrews 11:1 defines faith as "the substance of things hoped for, the evidence of things not seen." So, we must have hope and we must believe in things we cannot see to realize the full potential our faith! Faith has so much power that in Matthew 17:20 Jesus says, "for assuredly, I say to you, if you have faith as a mustard seed, you will say to this mountain, 'Move from here to there,' and it will move; and nothing will be impossible for you." It sounds so simple, doesn't it? Just hope and believe the Lord for things that can't be seen. Just a little bit of faith, the size of a mustard seed will be enough to move mountains. And, yet, it's almost incomprehensible for us to imagine telling a mountain to move from one place to another. 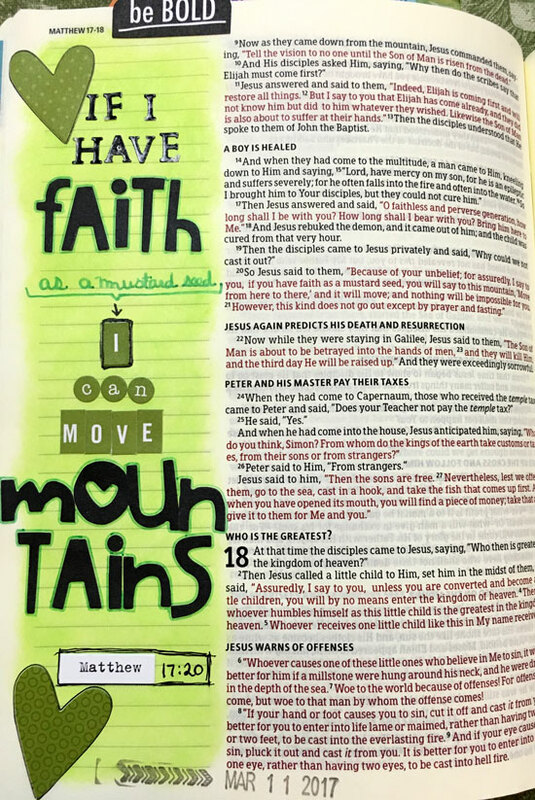 However, we face many "mountains" in our lives, and it's faith that will help us move them! Are you facing any seemingly insurmountable mountains? Have faith - hope in the Lord and believe in the answer you cannot yet see - and watch as that mountain moves out of your way! 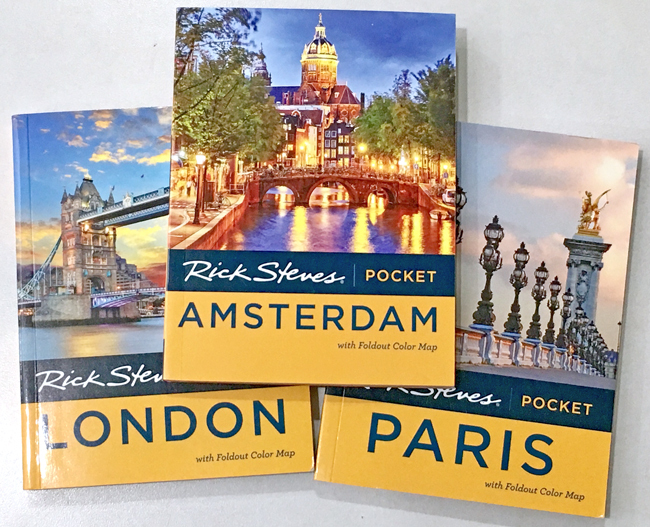 Airline tickets have been purchased, hotels have been books, and these exciting pocket guides showed up in the mail today! So excited to be planning an upcoming vacation! Please share your tips and not-to-be missed attractions, eateries, and/or activities for these three locations in the comments. In Joshua, chapter 3, we read about the Israelites crossing over the Jordan river. It was during the time of harvest, and the river was overflowing its banks. Yet, they walked across on dry land! God outlined the plan to Joshua, which began with Joshua commanding the priests who carried the ark of the covenant saying, "When you have come to the edge of the water of the Jordan, you shall stand in the Jordan." Then "the waters of the Jordan shall be cut off, the waters that come down from upstream, and they shall stand as a heap." And, finally, all the people would cross over the Jordan on dry ground. It's important to note here that the waters would not be cut off (or stop flowing or be backed up in a heap) until after the priests stood in the Jordan! The priests had to walk boldly into the water FIRST - then, and only then, would God stop the waters. Because the priests followed Joshua's instructions from the Lord, they witnessed a mighty miracle. I wonder what would have happened if they had not stepped into the water? I know God would have still fulfilled His promise to the Israelites. They would have still been given the promised land, yet it might have been that they had to wander in the desert a little longer. This is a lesson that we can each apply. When God instructs us to move forward, do we step out boldly? Or do we wait for God to perform a miracle first? Would we wait for the waters to stop flowing before we stepped into a river at flood stage? Or would we boldly put our feet in the water, confident that He would bring us to the other side? Oh, Lord, help me to step boldly in the direction You have for my life, that I may see Your miracles manifested! 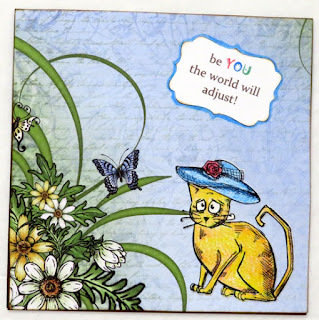 I haven't had time to make any cards to celebrate World Card Making Day today, however I have a few cards I created earlier this year to share for INSPIRATION. 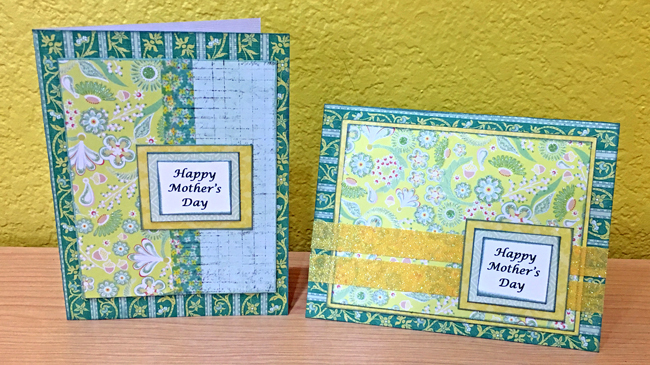 These first two were created using paper scraps, washi tape, and a stamped sentiment. These next cards were created during a class on using watercolors for card making. 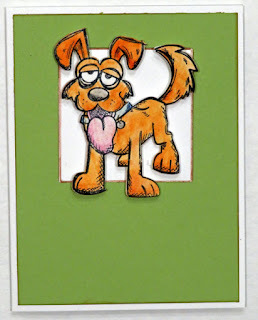 The cat and dogs were all stamped images that I painted with distress inks or watercolors (and sometimes finished with colored pencils). I used Authentique papers and a sentiment cut from the barcode strip of one of the papers for this final card. 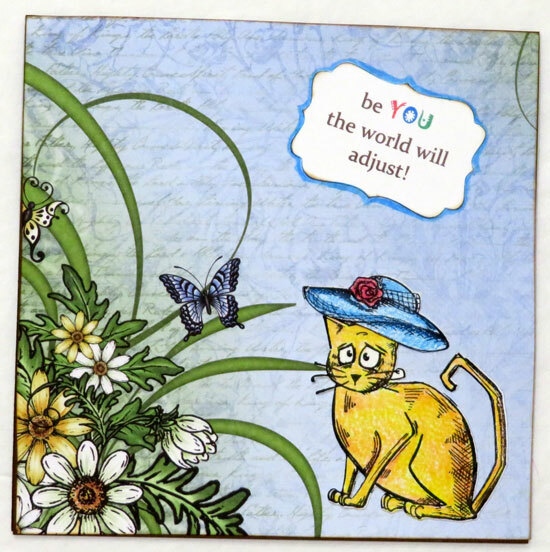 Did you make any cards to celebrate World Card Making Day? The library book club started up again last month, and we began with an interesting discussion of A Man Called Ove by Fredrik Backman. In chapter one of this story about Ove, a man in Sweden living in a row house, Ove is at a computer store buying an ipad. The next chapter goes back three weeks earlier and continues chronologically as it tells the story of how he tries to kill himself multiple times. However, something always keeps him from "success" - new neighbors driving into his mailbox, old neighbors stopping by with problems, a frayed rope, etc. Ove is a very unique character, and everything in his life is black and white, it's either right or wrong, there are no gray areas according to his philosophy. It turns out that Ove's wife had passed away several months before and he had recently been "retired" from the company he'd worked at since he was a teenager. Every day he goes to visit his wife's grave, bringing her flowers and discussing recent events. This was a fairly good story, however it was a very (very!) slow read. Since I already knew that his suicide attempts were not successful (because of chapter one), I was simply curious whether he was buying the computer for himself or the young family that recently moved to the neighborhood. There are several interesting characters in the book, but it honestly didn't hold my attention. The story has been made into a movie, which several ladies in the book club said they enjoyed. This month we read The Dollhouse by Fiona Davis. Like many recent novels, this one is set in two different time periods - 1952 and 2016; however, both stories take place in New York City and focus on life in the Barbizon Hotel. The older story centers around Darby, a recent arrival to the hotel, and the friendship she enjoys with the hotel maid, Esme. While Darby tries to succeed at secretarial school and avoid the mean antics of the Ford models living at the hotel, Esme encourages her to get out and enjoy the jazz scene and even perform as a backup singer at one point. The modern story centers around Rose, a journalist researching and writing a story about the accident that occurred at the hotel in 1952 when one of the women fell to her death from the rooftop balcony. This was an easy-to-read story. I found it enjoyable, however, most of us at the book club agreed that these were not characters that we became really invested in because they each seem so helpless in her own way and don't seem to grow or mature as the story goes forward. We also agreed that the ending was satisfactory, but it was all wrapped up so quickly and in a rather unbelievable way. I especially enjoyed learning about The Barbizon Hotel as the author did a lot of research about life at the hotel (before it was turned into the very expensive condos housed there today). Here's a link to a great article about the hotel and some of its more famous occupants through the years. It's interesting to note that there are still ten women living in rent-controlled apartments on one of the floors. These women have lived there many years, and the author interviewed them as part of her research for the book. 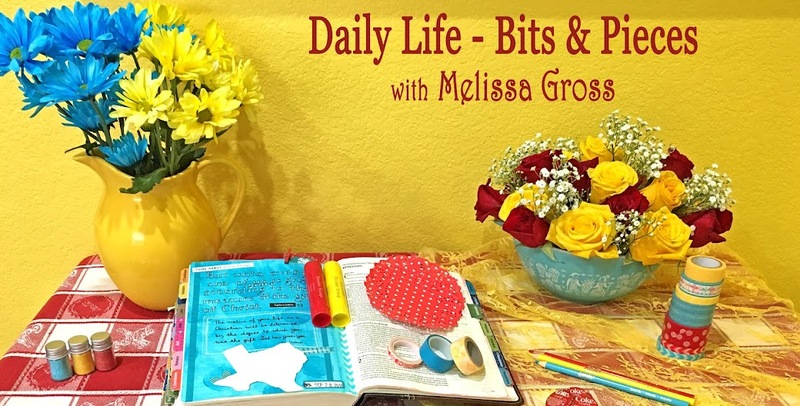 (One of the great things about our book club leader is that she always finds author interviews and other interesting articles like this one that relate to the books we're reading!) Here's a link to one of the author interviews. I actually first heard about Ready Player One at one of the Stay Calm & Read On events at the library last year. This story is set in the year 2044, a time when everyone spends most of their waking hours in a virtual reality game because the real world is an ugly place. The main character is Wade Watts, a teenager living with his aunt in the "stacks" - scaffolding like contraptions that allow trailers and campers to be stored (and lived in) on top of each other. When the creator of this all-consuming virtual reality game dies, his will specifies that the person who wins the final game (full of puzzles with allusions to the 1980s pop culture the creator was obsessed with) would inherit massive power and fortune and the rights to the game. Wade is the first one to stumble onto the first clue, and then the competition heats up as others in the virtual world begin to close in on the ultimate prize. I did find it extremely disturbing that the virtual world was more important to many of the characters than their lives in the real world. This was a very interesting read with a nice conclusion. I enjoyed the pop culture references, although there were many that were lost on me as I wasn't into many video games during that time and never owned one of the (then) new home game systems. I put this book in Robbie's to-read pile, so we'll be all ready for the movie when it premiers next spring. 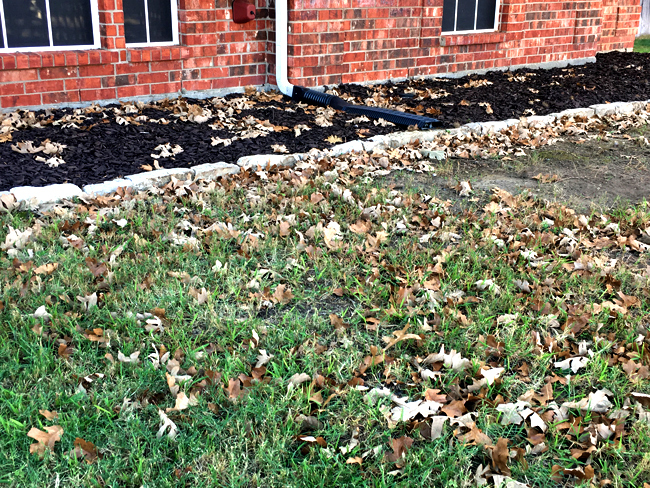 Here in Texas, fall is often referred to as second summer. The weather's really not all that much different - the sun's still shining most days, the temperatures are in the 80s and 90s, grass is still green, and most of the trees are holding tight to their leaves. All except one of the trees in our front yard. 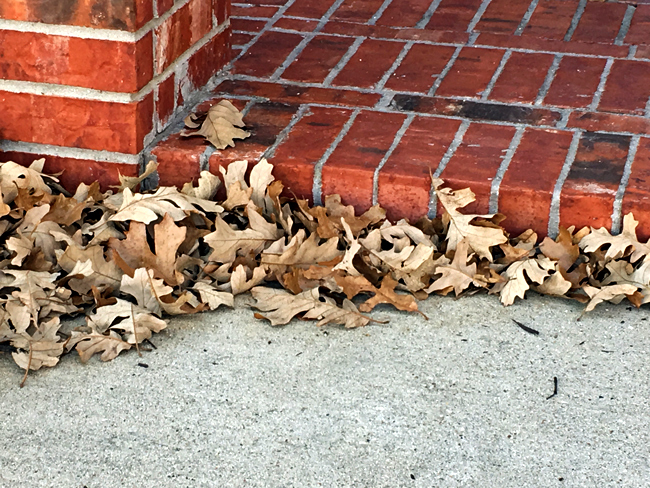 I'm not sure exactly what kind of tree it is, but there are several in the neighborhood, and they are always the first to lose their leaves! 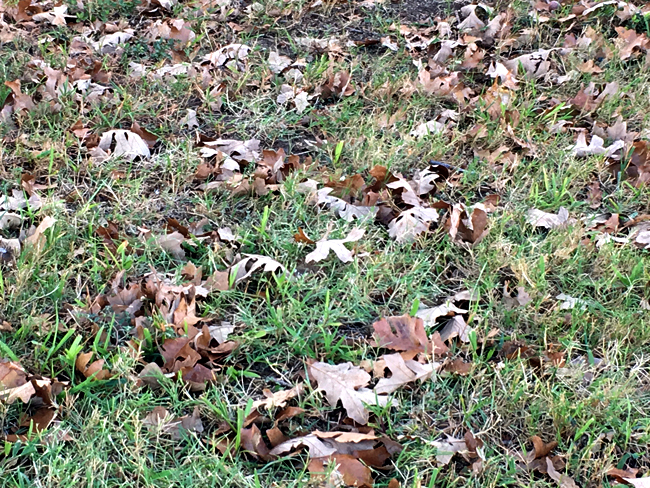 These leaves don't even have the decency to provide beautiful colors before turning brown seemingly overnight. 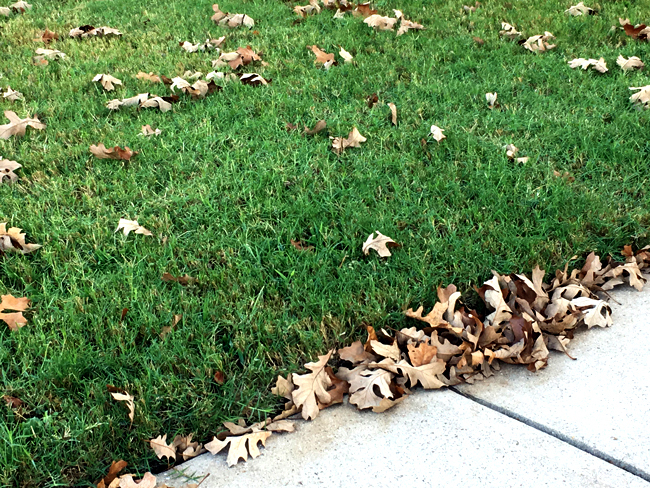 I snapped these photos this morning in order to capture this "fall activity" before the lawn service arrives later today. 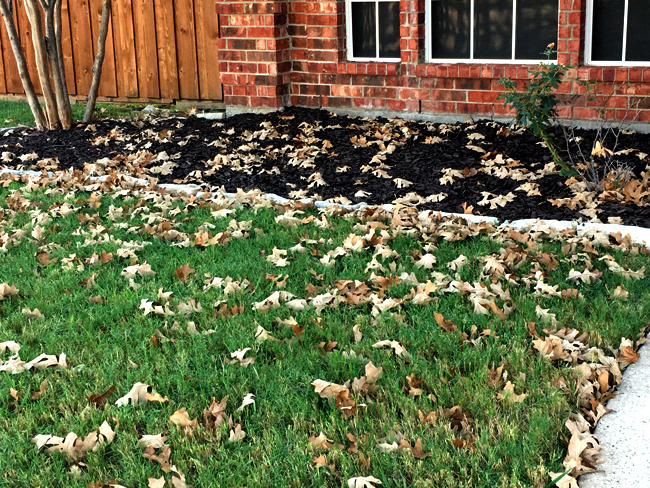 The leaves will be blown out of the beds and off the sidewalk and mulched into the grass, erasing all signs that fall has arrived. Joining in with this month's 5 in 5 photography meme hosted by Sandi. What have you taken 5 minutes to snap photos of lately? 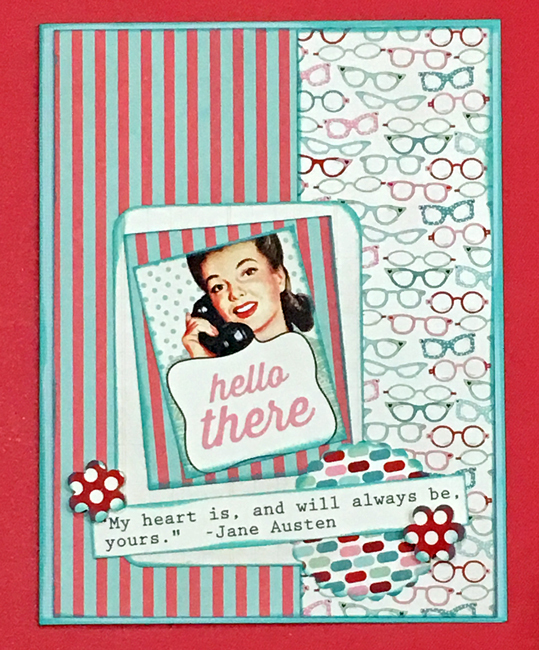 Although I did not complete Cathy Zielske's Design Your Life 2.0 workshop this summer, I did create a few layouts using some of the digital templates provided with the class (along with some digital papers and embellishments from my stash). This asymmetrical layout has the same design as the First Time Ice Skating layout I shared previously. I love how the digital format allowed me to use a photo for the background. 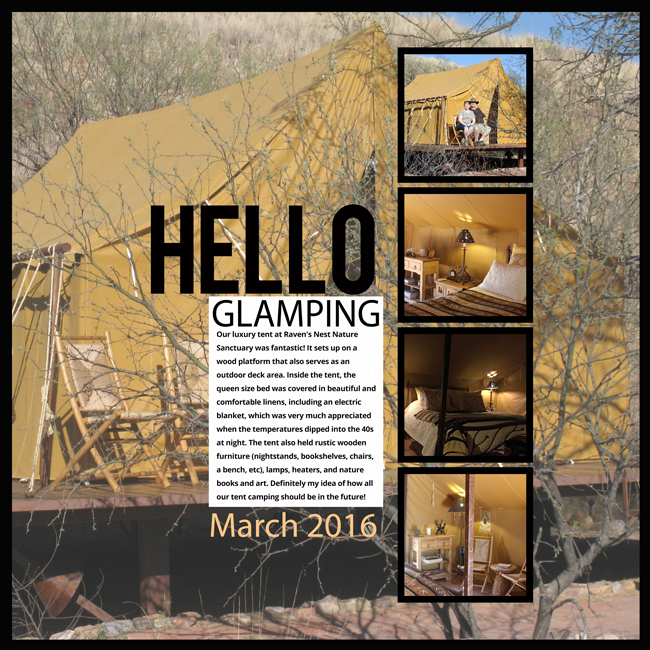 And, of course, the memories from our glamping adventure make me smile! 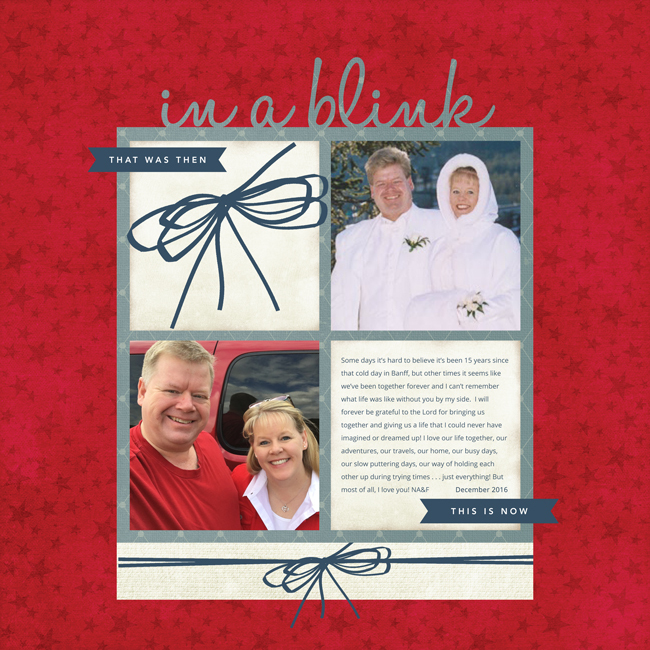 For the symmetrical layout, I chose to highlight then and now photos from our wedding day and our 15th anniversary. The original template had the photos and journaling switched, however I wanted us to be looking into the layout and felt pretty accomplished that I got it all turned around correctly. 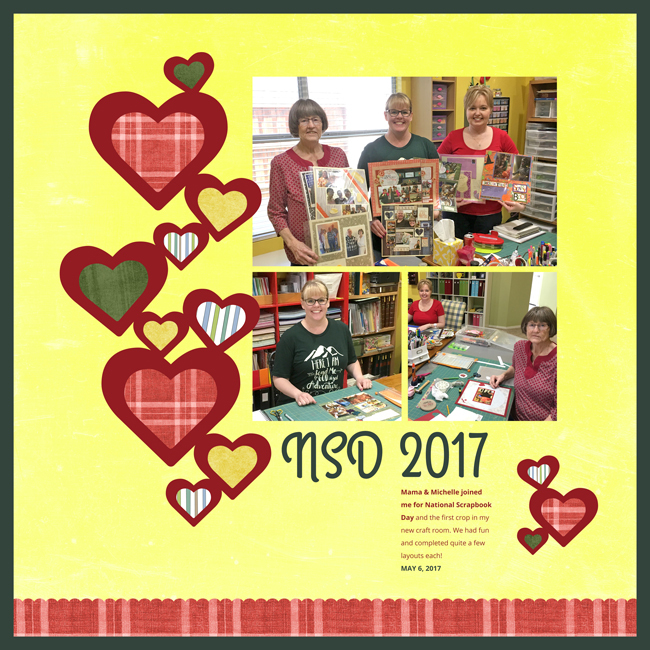 Repetition is what makes this next layout stand out - all those layered hearts draw the eye to the photos from National Scrapbook Day earlier this year. 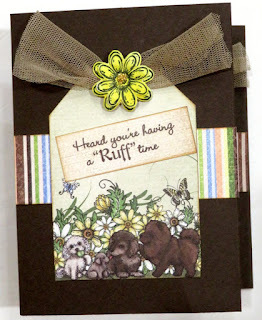 I added an extra border around this layout as well as the border strip at the bottom. Finally, I'm learning how to modify templates and add a little of my own touches. Did you participate in DYL 2.0? Have you created any digital layouts lately?